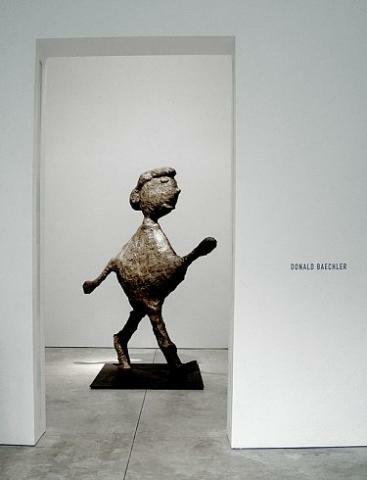 The American artist Donald Baechler, who was born in Hartford, Connecticut, in 1956, is widely considered one of the most interesting painters of his generation. In addition to paintings, his oeuvre includes drawings, collages and, increasingly since the mid-80s, sculptures. His repertoire of motifs is to be found dispersed across different genres, starting from drawings and ending up as sculptures where, after a process of transformation, these motifs finally take on three-dimensional volume. Yet even here the signature of the painter remains visible in the colored patinas of the bronze sculptures' heavily worked surfaces. I'm interested in discreet and very mute objects, and I've never really been interested in narrative or psychology or these things which many people read into my paintings and probably into the sculptures." This will be the first presentation of the artist's bronze sculpture in New York City.